Exciting news! A brand new ReFuel Renewable Natural Gas station opened up in San Jose last month. Expanding RNG infrastructure is an exciting opportunity to make this green alternative fuel available to more businesses and drivers. Read on to learn where you can find our new station, and how ReFuel will help strengthen San Jose’s economy and reduce environmental impact. Our new ReFuel Renewable Natural Gas station is located at 1170 N. 4th St. in San Jose, CA, 95112. The station is located in convenient proximity to the Wyndham Garden San Jose Airport, HWY 880 and HWY 101, making it the perfect fill-up point for truck drivers and commuters. The San Jose station was built to compliment the city’s Green Vision 2022 plan. This plan will bring 25,000 new green jobs to San Jose, and encourages the use of alternative fuels and renewable energy. 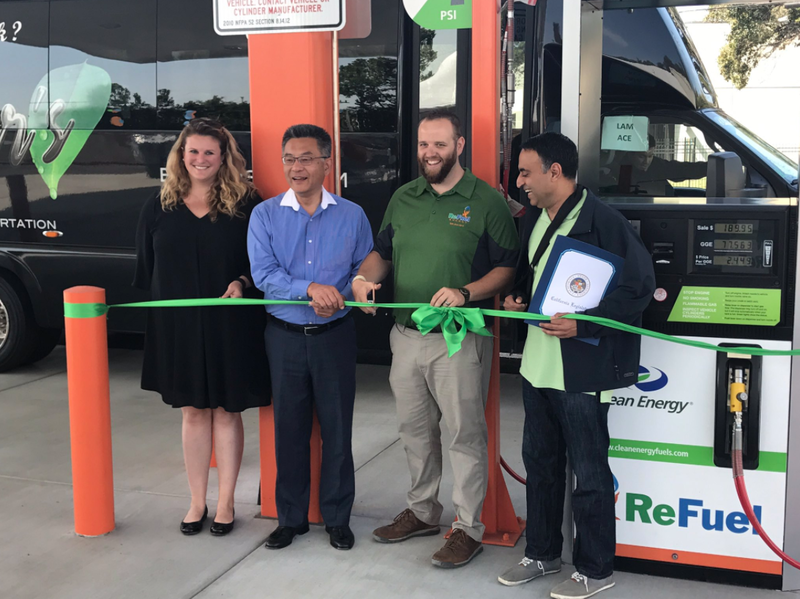 ReFuel Energy Partners was incredibly honored to host the local State Officials for the area – Senator Jim Beall and Assembly Members Kansen Chu and Ash Kalra – to celebrate the station’s grand opening and its contribution to San Jose’s and the State of California’s vision for the future. Jim Beall, California State Senator, District 15 and Sean Moen, General Manager of ReFuel Energy Partners. From Left to Right: Lindsay Harrison from Clean Energy Fuels, Kansen Chu, California State Assemblyman representing District 25 Sean Moen, Ash Kalra, State Assembly Member for California State Assembly, District 27. ReFuel Energy is proud to be part of a growing industry. Expanding natural gas infrastructure makes alternative fuels accessible to more people, creating a green, affordable future for all of us. Our ReFuel station in San Jose and our original Sacramento station are conveniently located along major transit routes. Learn how we can work with your fleet!